This EVA Air business class flight review is part of my trip to Japan and New Zealand a few months ago. EVA Air (pronounced E-V-A Air) is a Star Alliance member and is the second largest, full-service airline in Taiwan. From its Taoyuan Taipei hub, EVA Air flies to 40 international destinations across Asia, Australia, Europe and North America. EVA Air is a four star rated airline by Skytrax and is best known for their ridiculous Hello Kitty jets. Their frequent flyer program is called Infinity MileageLands and they are a Citi Thank You Rewards transfer partner. I left the EVA Air Evergreen Lounge about 30 minutes prior to boarding time and made my way to gate C7. I left with plenty of time as I wanted to stroll around and explore the airport a bit. Good thing I did, as each individual gate had their own passport control and secondary security check that I did not know about. Luckily, that process was quick and efficient and I arrived at the gate with a few minutes to spare. I took some pictures of the bird and waited for boarding to be called. Boarding was delayed about 20 minutes and started with business class passengers and Star Alliance Gold members. Business class passengers boarded through door 1L and all other passengers boarded through 2L. 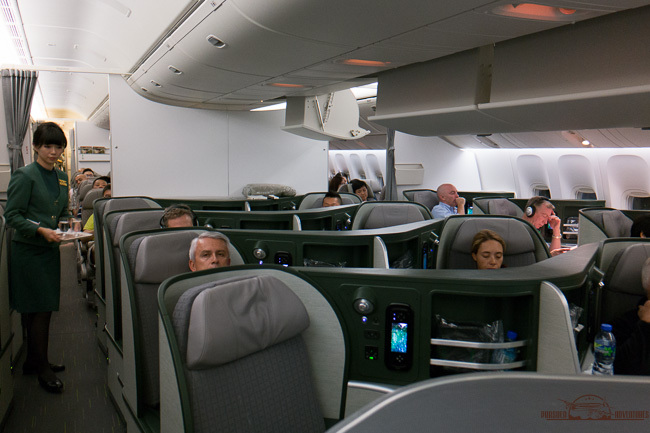 There are two business class cabins on the Boeing 777-300ERs. The forward business class cabin is located between doors 1L and 2L and the rear cabin is located aft of door 2L. Because the rear business class cabin was located aft of door 2L, there was significantly more foot traffic through the rear business class cabin than through the forward cabin. EVA Air operates these Boeing 777-300ER jets to all of their North American destinations including Los Angeles, San Francisco, New York and Seattle. Service to Houston will begin June 19, 2015. These brand new jets are configured with a three-class configuration: Royal Laurel (Business Class), Elite (Premium Economy) and Economy. Before I continue, I should clarify that “Royal Laurel” is EVA Air’s newest business class product whereas, “Premium Laurel” is their older business class product. Premium Laurel Business Class seats are your standard 2 x 2 x 2 angled lie-flat seats with 170 degrees of recline. They are not the best seats but are still found on their Airbus A330s and Boeing 747s. Most of their Boeing 777s have been converted to the newer Royal Laurel seats by now but it doesn’t hurt to double check your plane using a seat advice site like Seat Guru before booking your flight. EVA Air Business Class (Royal Laurel) cabins are configured in a 1 x 2 x 1, reverse herringbone layout. The forward Business Class cabin is the bigger of the two with 22 seats and the rear Business Class cabin is a bit more intimate and private with only 16 seats. On this flight, Business Class was fairly full with only a couple of seats empty in the rear cabin. I was seated in seat 10K, a window seat on the right side of the plane of the rear cabin. Behind the rear Business Class cabin is the Premium Economy cabin with 64 seats in a 2 x 4 x 2 layout. The premium economy seats offer 38 inches of pitch, 19.5 inches of width and a couple extra inches of recline. Behind the Premium Economy cabin are two Economy Class cabins with standard seats in a 3 x 3 x 3 layout. Standard economy seats offer 33 inches of pitch and 18.3 inches of width. That’s not a bad Economy Class seat and I’ll take this over United’s economy class seat any day. EVA Air Business Class seats are true, lie-flats. They offer 71 inches of pitch, 26 inches of width and when fully reclined, the bed length measures 6.5 feet in length. Each seat is equipped with its own personal Audio Visual On-Demand (AVOD) In-Flight Entertainment (IFE) system, universal electrical outlet, USB port and two personal reading lamps. These seats are incredibly spacious and have a ton of storage spaces. In addition to the overhead bins, there are plenty of small pockets at the seat to keep your passport, cell phone, laptop and other small electronics nearby. Comfort-wise, they are extremely comfortable in both sit and bed mode as the parts of the seat can be controlled individually. Reverse herringbone seats are great for solo travelers but not so great for couples traveling together as they are offer a bit too much privacy in between the seats. If you’re traveling together, I would recommend the two middle seats as they face towards each other. Each window seats gets two windows for your viewing pleasure. Waiting at our seats were blankets, two pillows, noise-cancelling headphones, slippers and bottles of Fiji branded water. As we were getting settled into our seats, the flight attendants came by to offer everyone a packaged wet towel, pre-departure drink (orange juice or water) and printed menus. After a few minutes, the flight attendants came back around to take meal orders. After all the passengers were boarded, we pushed back from the gate, made our way to the runway and began our 12 hour and 14 minute journey to Los Angeles. Once we reached cruising altitude, the seatbelt signs were turned off and the flight attendants came by to pass out amenities kits and pajamas. Usually found on other airlines as a First Class amenity, EVA Air Business Class passengers get a set of pajamas on all long-haul flights. And unlike other airlines like ANA that make you give them back at the end of your flight, these are yours to keep. The pajamas were soft, lightweight and super comfortable. However, they do run a bit on the small side so go up a size if you think you need to. Amenities kit-wise, they don’t get any better than these Rimowa branded kits. Also found on other airlines as a first class amenity, EVA Air offers them as a business class perk. And inside, you’ll find Harnn branded moisturizer and lip treatment, socks, eyeshades, earplugs, comb and a dental kit. Though not very useful for repurposing, these Rimowa branded kits are stylish collector’s items and can fetch up to a hundred dollars each on eBay. Once I got my pajamas, I went into the bathroom and changed out of my street clothes. The bathrooms were standard size but were stocked with more Harnn branded face and body products. In case you haven’t heard of them, Harnn is an Asian inspired, luxury brand of bath and body products. Just for reference, bottles of lotion run about $50 at retail value. When I got back to my seat, the flight attendant came by to ask me for my pre-meal drink selection. That was a no-brainer and I “settled” for the 2004 vintage Dom Perignon for my pre-meal drink. Drinks were served with a package of lemon cookies in a bowl. Lol. I know. I thought that was weird also. Why even bother with the bowl? More drinks continued as our tables were then set and prepared for our five course meal service. Each dish was served individually and cleared before the next course was served. Our meal started with an appetizer dish of foie gras and red wine baby pear slices. Just look at those cool, pebble shaped salt and pepper shakers! After the appetizer dish was cleared, we were served a creamy apple and white turnip soup, bread from a bread basket and a small side salad. For the main course, I chose the traditional ethnic dish which was Wu Shi style, braised pork spare ribs with mixed vegetables and egg fried rice. After the main course was completed, our trays were cleared and the flight attendants came by with a fruit, cheese and dessert cart and coffee/tea. I’m not much of a cheese guy so I skipped that but the fruit and dessert plates were delicious. One of the perks of flying an Asian airline is that you actually get fruits from the local area. Unlike your average berries and melon, we were served dragon fruit and this other pear like fruit that was really tasty. The pearl chocolate yogurt mouse, pineapple tart dessert was delicious and beautifully presented. And yes, those hearts were special just for me. Lol. Just kidding. I think everyone got them. I’m sure you can’t tell by the pictures but the food was really good. The dishes were plentiful, delicious and beautifully presented. It really was a lot of food and the fat kid in me couldn’t get enough of it. And if you were paying attention, we were served a soup course, which again, is usually presented as part of a first class meal service on other airlines. Absent the caviar, this really was a first class meal. The meal service was appropriately paced and the flight attendants came around frequently to refill my glass of Dom, serve food and clear out plates. Nothing sat on my table for more than a few minutes after I was done with it. After dinner, the lights were dimmed and I put my seat into bed mode. With a full belly and some glasses of Dom under my belt, I was totally happy and settled in for a movie. The IFE system was pretty good. The large 15” screen was clear and crisp and there was a decent selection of about 40 new(ish) and classic movies, television shows, music, games and a moving map. The seat in bed mode was extremely wide and comfortable. For those needing some extra space in the shoulder area, you can retract the arm rest to give you some more wiggle room. After a couple of movies, I fell asleep and stayed asleep for longer than I wanted. No one wants to read a trip report where the blogger just slept through the entire flight but I couldn’t help it. I was intending on waking up and having a snack but I completely slept through all of that. I ended up waking about two hours before our arrival into Los Angeles and about 30 minutes before breakfast service. Sorry. About an hour and a half before arrival, the lights were turned on and the flight attendants prepared for our pre-arrival, breakfast service. Again, I went with the Royal Laurel special which was a noodle dish with pork. And yes, it was delicious. After breakfast, I had some coffee and enjoyed the most amazing views of the California coast and downtown Los Angeles as we approached LAX. Service wise, the flight attendants were great. They all spoke English fluently and everything was said with a smile. They walked the cabin frequently and made sure we were taken care of. My drink was refilled several times and I never had to ask for anything. I loved that they were proactive in taking care of us. I was really impressed with them and this EVA Air Business Class flight really blew all of my expectations out of the water. Both the hard and soft products were phenomenal and no other business class product can compare to EVA’s Royal Laurel service. I mean, what other airline offers first class perks such as pajamas, Rimowa amenities kits, Dom Perignon and five course meals for their Business Class passengers? And dare I say, it’s such a superior Business Class product that it can compete with other airline’s First Class products. I’m looking at you United and British Airways. For a relatively small full-service airline, EVA Air has really made a name for themselves and I can’t wait to fly them again. One final note – at the time of this trip, Dom Perignon was still served on EVA Airways. I understand that they have since switched to a Veuve Cliquot La Grande Dame and no longer serve Dom. That really is a shame but regardless, you will still enjoy your EVA Air Business Class experience even without the Dom. So don’t worry. For those of you that enjoy a lot of pictures, I created a video slideshow for you here.